It’s available on Amazon as an e-book and paperback. 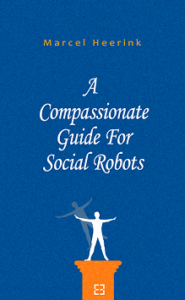 The e-book version peaked the Kindle best seller list for a few days in the categories ‘Essays & Commentary’ and ‘Human-Computer Interaction’ in the last week of January 2019. On this page, you’ll find links to reviews, media coverage, video’s illustrating the philosophical and psychological issues addressed in the book (I use these in lectures, workshops and presentations) and downloads like a press kit, references and documents on thought experiments. Indeed, it’s hard. Wherever I had to list the book, I found it hardly possible to choose the right categories. It’s a blend of storytelling and essays and having to choose between fiction and nonfiction is already a tormenting job (why is there never a ‘blended’ category?) Moreover it can rightfully be classified as philosophy, psychology, sociology, science, technology and even humor. Being as specific as I can, I would say it’s about human-robot interaction, human-centered AI and suspension of disbelief is the main theme. Just click the cover picture, or click here. “…sure to captivate, surprise, and touch the reader”.